On Friday 10 December 1948 The United Nations adopted and proclaimed the Universal Declaration of Human Rights. The day was from then recognized and celebrated as International Human Rights Day. When the General Assembly adopted the Declaration, with 48 states in favor and eight abstentions, it was proclaimed as a “common standard of achievement for all peoples and all nations”, towards which individuals and societies should “strive by progressive measures, national and international, to secure their universal and effective recognition and observance.” Countries across the world celebrate this day every year. It is in line with this that our heroes at the Long March to Freedom strove to see to it that all South Africans enjoy their rights in a free nation. Today Anton Lembede would have celebrated his 70th birthday this year, had he not died so young at 33. We honour this founding member and first president of the ANC Youth League in the #LongMarchToFreedom. 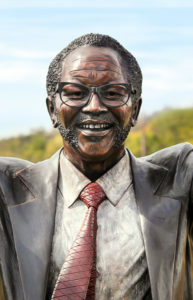 Visit him and other Young Lions, #Tambo, #Mandela and #Sisulu at #FountainsValley, Pretoria. ‘The hour of youth has struck!.’ So proclaimed a flyer issued by the Provisional Executive Committee of the newly formed ANC Youth League, advertising the organisation’s first conference to be held in September 1944. The Youth League had launched six months earlier, at Johannesburg’s Bantu Social Centre in March 1944 but it was at the September conference that Anton Lembede was elected from among his equally dynamic peers to become first president of the ANC’s youth wing. 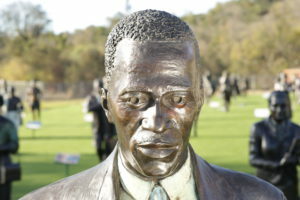 According to Lembede’s close friend and housemate Ashby P. Mda, the first person to mention or suggest the founding of a Youth League was actually Manasseh T. Moerane. However, Moerane was not to take a leading role in the formation of the League and subsequently has not been noted in popular histories of the ANCYL. Both founding members, Lembede and Mda had become close friends in 1943 and had to share accommodation as a result of their low wages. Their time together was spent engaging in intellectual discussions which gave birth to the ideals that were to shape the organisation and future generations to this day. Mda acknowledged that Lembede ‘took his word in many things’ and was very respectful and loving toward him. He never wanted to clash openly with him, but in private they had intense arguments. He would attack others publicly but was to Mda ‘as soft as a newly wedded maiden’. This gave others the impression that Mda was steering Lembede from behind the scenes, but in fact they clashed in privately on many issues of principle. In the 1930s the ANC, under the leadership of Alfred Bitini Xuma, had been revived but its methods remained cautious and respectful towards the white elite. Every resolution of the ANC started with statements like, ‘We pray the Minister… We humbly request…’ Annoyed by this pacifism, this group of young intellectuals became agitated and demanded a shift towards a more militant style of politics. Jordan Ngubane, a youth leader regarded as a philosopher, together with Lembede and Mda drafted the League Manifesto, although Lembedes’ ideas are said to have dominated the document. Although Xuma was worried that the manifesto was disrespectful as it was scathingly critical of the senior ANC, he still gave the youth support. The document pointed out that the formation of the Youth League was based on criticisms against the ANC which was seen as elitist and ‘not an efficiently organised bloc’, lacking a ‘constructive programme to enforce the repeal of all oppressive legislation’. The Youth League aimed at imparting to the ANC a national character rooted in African nationalism and African self-determination. Many older ANC leaders dismissed the League as irresponsible and cheeky, partly because Lembede was extremely passionate and dogmatic about his beliefs. 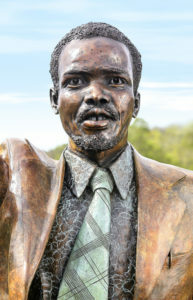 However, his influence was shown when the moderate Xuma lost the presidency in 1949 to James Moroka who was more supportive of the Programme of Action presented by Lembede in the same year. Sadly, Lembede died prematurely on the 30th of July 1947 at the age of 33. Mda took over leadership and formed a working committee consisting of Walter Sisulu, Oliver Tambo and Nelson Mandela. These, as history has shown went on to further prove that indeed the hour of youth had struck. Glaser Clive. The ANC Youth League. Johannesburg: Jacana Media, 2012. Karis Thomas and G.M Carter. From Protest to Challenge: A Documentary History of African Politics in South Africa, 1882-1964. Vol 2. California: Hoover Institution Press, 1979. On the 5th of December 1925, Queen Labotsibeni passed away. Born in 1858 at eLuhlekweni northern Swaziland, Labotsibeni was a Princess of the Mdhluli section of the Swazi Nation. She was the wife of Ngwenyama Mbandeni and mother of Bhunu Heli Mahlikhlo Ngwane III and grandmother of King Sobhuza II. 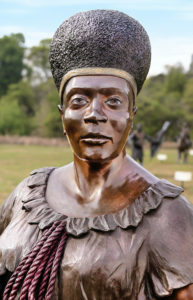 She was proclaimed the Ndhlovukazi (Queen) after the death of her husband in 1889 and ruled for 36 years, first as the Queen mother and then as the Queen Regent as Sobhuza was too young to rule. Queen Labotsibeni at the Long March to Freedom in Pretoria. Labotsibeni’s ascension to the throne was rather atypical as Swati traditional laws did not allow a woman in her situation to rule. Second, her clan, Mdluli, was not next in line to rule Swaziland. In spite of this, she was chosen because of “her outstanding intelligence, ability and character and experience.” Also known as Gwamile (meaning the indomitable one) she was acknowledged by many representatives of Britain as one of the cleverest rulers in Africa, a shrewd diplomat who bravely led and defended Swaziland. During her reign she tried to regain tracts of land that her husband had lost to European settlers by raising 40 000 pounds to buy it back, however she was not successful. Her campaign coincided with protests against South Africa’s 1913 Natives’ Land Act. In solidarity, Labotsibeni contributed to the South African Native National Congress (SANNC) 1914 delegation to Britain to protest the act. In 1921 she and Crown Prince Sobhuza, later King Sobhuza II, financed and co-founded the Abantu-Batho newspaper, the mouthpiece of the SANNC. A strong African nationalist, the Regent had registered the infant Prince Sobhuza as a member of the ANC at its inception in 1912. A rainmaker and one of the richest women in South Africa, she was not known to wear European clothes although the Queen of England is said to have sent her many. This was perhaps a sign of her Africanism and being grounded in tradition. She died in Swaziland at the age of 80. We remember this great woman and icon of the struggle for freedom today at the Long March To Freedom. Christison, G. 2007. African Jerusalem: The Vision of Robert Grendon. PhD Thesis, University of KwaZulu-Natal, pp.773 and 774. Ginindza, T. 1996. Labotsibeni/Gwamile Mdluli: The Power Behind the Swazi Throne, 1875-1925, Annals, New York Academy of Sciences, pp.135-158. Mkhonza, S. 2012. Queen Labotsibeni and Abantu-Batho. In: Limb, P. ed. 2012. The People’s Paper: A Centenary History and Anthology of Abantu-Batho. Johannesburg: Wits University Press. On the fourth of December 1981, Ciskei was granted independence. Ciskei which means “on this side of the Kei River’ was granted independence by the South African government in 1981, following a referendum conducted by Lennox Sebe, leader of the Ciskei National Independence Party (CNIP). Under South Africa’s policy of Apartheid, land was set aside for black peoples in self-governing territories. The homelands system lay at the heart of the National Party (NP) government’s policy of territorial and political separation based on race. The Bantu Authorities Act was passed in the early 1950s, increasing the powers of traditional authorities in preparation for self-governance, and in 1959, the Promotion of Bantu Self-Government Act provided the legislative basis for the future homelands. The government argued that Africans could develop as a nation better if they were settled in their tribal home lands. Ciskei was designated as one of two homelands or “Bantustans” for Xhosa speaking people. Ngqika (Rharhabe) Xhosa people were resettled in the Ciskei, and Gcaleka Xhosa were settled in the Transkei, the other Xhosa homeland. It was the largest un-segmented Bantustan, in south Eastern Cape Province (currently the Eastern Cape) with a succession of capitals during its existence. Originally, Zwelitsha served as the capital with the view that Alice would become the long-term national capital. However, it was Bisho (now spelled Bhisho) that became the capital until Ciskei’s reintegration into South Africa. After the granting of independence, Sebe was elected “President for Life” of the new “state.” The Sebe regime rapidly became notable as one of the most repressive of the Bantustan governments. It is believed by some that Sebe never enjoyed any degree of popular support. However, some residents of the Ciskei during his time did support his traditional type of rule and recall how he used to slaughter a beast at the end of every month. He is also credited for building and developing Bisho. It was not until 1989 that open opposition to his government gained momentum. On the 15th of December 1993 the South African Parliament voted to restore citizenship to residents of the so called independent states. As the political situation in South Africa improved in 1990, residents of Ciskei began to agitate for similar reforms. The South African Homelands or Bantustans ceased to exist on 27 April 1994, and were re-incorporated into the new nine provinces of a democratic South Africa. On the 1st of December 1999, UNESCO listed Robben Island as a World Heritage site. Under Apartheid Robben Island was the prison in which most black male political prisoners who opposed the apartheid regime were incarcerated from 1962 to 1991. However, as far back as the 1650s, African chiefs like Autshumato, Makhanda and Maqoma had been imprisoned on the Island for as long as 21 years and more. Imprisonment warranted strategies that would ensure that prisoners survived the confinement, restriction and isolation. Chiefs such as Autshumato and Maqoma resorted to escape as the only way to free themselves from these conditions. During the Apartheid era, when security had been upgraded and escape had become more difficult, prisoners used several ways to make their lives in prison bearable. Nelson Mandela at the Long March To Freedom in Pretoria. He was imprisoned on Robben Island for 27 years. In the winter of 1964, Nelson Mandela arrived on Robben Island where he would spend 18 of his 27 prison years. Confined to a small cell, the floor his bed, a bucket for a toilet, he was forced to do hard labor in a quarry. He was allowed one visitor a year for 30 minutes. He could write and receive one letter every six months. George Bizos, Mandelas’ lawyer and long-time friend recalled how Mandela used his boldness and charm to relate with the guards in such a way that he gained their respect and better treatment. He recalled how on his first visit to Mandela, he seemed to set the pace at which he and the warders moved, which was unusual for a prisoner to do. Mandela went on to say “George, I’m sorry, I have not introduced you to my guard of honour.” He then proceeded to introduce each one of the warders by name. The warders were stunned but went on to respectfully shake Bizos’ hand. Mandela later stated in his biography that the most important person to a prisoner was the prison warden who was the most immediate person to go to when one needed an extra blanket or any assistance. Having friendly wardens was also vital for the purposes of communication with fellow prisoners in different sections so as to continue with the work of the ANC. 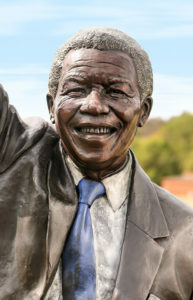 Unlike Mandela however, some prisoners felt that the survival of their ideals depended on them maintaining a distance from the wardens who represented the Apartheid regime. Govan Mbeki for example distanced himself from members of the Prisons Service and spoke only when it was necessary. Mbeki also did not watch television as he viewed Western films as products of capitalism. Sport was also an integral part of social life. At first the men played covertly in their cells using balls made of paper, cardboard and rags. One bold prisoner in the 1960s, is said to have stood up and requested that they be allowed to play soccer and was as a result punished for it. In 1965, after sustained lobbying, the authorities allowed prisoners to play outside on Saturdays. The teams built their own goals and threw off their prison uniforms to put on team colours. The National Heritage Monument honours these survivors. Many former Robben Island prisoners stand at the Long March To Freedom in Pretoria, a celebration of conquest over adversity. Robben Island – The Dark Years” INTERVIEW EXCERPT. From Chapter 66 of Mandela’s autobiography Long Walk to Freedom. Fran Lisa Buntman. Robben Island and prisoner resistance to Apartheid. Cambridge University Press, 2003.